Interstate 70 at Idaho Springs. The I-70 Mountain Peak Period Shoulder Lane Project in 2014-15 expanded the eastbound freeway to accommodate the Express toll lane in place of the left-hand shoulder. Photo taken 08/11/16. Emerging from the Eisenhower Tunnel, Interstate 70 quickly encounters a narrow trumpet interchange (Exit 216) with U.S. 6 west. Photo taken 08/11/16. Loveland Basin and Valley ski areas reside just off U.S. 6 by Exit 216. Photo taken 08/11/16. U.S. 6 (Route 006F) makes a number of switch backs southward on the 4.1 mile climb from Interstate 70 to Loveland Pass (el. 11,992 feet). Photo taken 08/11/16. Exit 216 lowers to U.S. 6 west as Interstate 70 enters Arapaho National Forest. Photo taken 08/11/16. Interstate 70 drops 2,600 feet in elevation from the Eisenhower Tunnel east portal to milepost 229 in north Georgetown. With 5 and 6% grades, truckers are advised to user lower gear. Photo taken 08/11/16. Taking Exit 216, a guide sign directs motorists onto U.S. 6 west back toward Loveland Basin ski area. Segment F of U.S. 6 merges onto I-70 east beyond Loveland Valley ski area in 0.7 miles. Photo taken 08/11/16. Interstate 70 arcs northward between Mount Shiktau and Mount Bethel to Exit 218. Photo taken 08/11/16. A snow chain station lies one mile ahead at milepost 219. Photo taken 08/11/16. The diamond interchange at Exit 218 serves the Herman Gulch Trailhead. Photo taken 08/11/16. This shield assembly stands along the Interstate 70 eastbound curve south of Mount Parnassus. Photo taken 08/11/16. The aforementioned I-70 east truck chain station lies south of Watrous Gulch. Photo taken 08/11/16. Interstate 70 aims for Ganley Mountain before turning north again on the winding course east into Silver Plume. Photo taken 08/11/16. Travelers along I-70 east leave Arapaho National Forest on the one mile approach to Exit 221 for Bakerville. Photo taken 08/11/16. Entering the diamond interchange (Exit 221) with Stevens Gulch Road south to Grays and Torrey Trailhead and the south side Frontage Road east. Photo taken 08/11/16. Construction of Interstate 70 east to Silver Plume directly overlaid U.S. 6 in 1972. Photo taken 08/11/16. A waterfall appeared on the south slopes of Bard Peak along Interstate 70 ahead of milepost 222. Photo taken 08/11/16. Continuing east along side Clear Creek, the freeway progresses toward Silver Plume and the distant Griffith Mountain. Photo taken 08/11/16. Another pair of advisory signs advocate lower gear for truckers. I-70 passes between Cloud and Deadman Gulch in this scene at around 9,400 feet above sea level. Photo taken 08/11/16. A diamond interchange (Exit 226) joins Interstate 70 with Woodward Street in Silver Plume in one mile. Photo taken 08/11/16. Two and a half miles remain until truckers are clear of the 6% grade descent of Interstate 70 eastbound. Photo taken 08/11/16. Situated at 9,118 feet above sea level, the small town of Silver Plume comprises a small street grid, mostly on the north side of Interstate 70. Photo taken 08/11/16. Exit 226 leaves Interstate 70 east for Woodward Street north to Main Street and the town center and Mountain Street on the north slope of Leavenworth Mountain. Photo taken 08/11/16. Turning north around Republican Mountain, a scenic view area lies just ahead. Visitors seeking Bighorn Sheep are advised to continue north to Georgetown (Exit 228). Photo taken 08/11/16. Interstate 70 shoots through a gap north of Pavilion Point on the descent into Georgetown. The grades are less pronounced beyond forthcoming Exit 228. Photo taken 08/11/16. The off-ramp for the eastbound scenic area follows. Old U.S. 6 emerges from the freeway just north of here, partially as the Silver Plume to Georgetown Express multi use path. Photo taken 08/11/16. Exit 228 departs from I-70 east in one mile for 15th Street east in Georgetown. Photo taken 08/11/16. Georgetown lies at 8,519 feet above sea level. An array of traveler services are located in the town of 1,000. Photo taken 08/11/16. Truckers with failing brakes are directed to stay on Interstate 70 beyond Georgetown, as the freeway flattens out for a period. Photo taken 08/11/16. A visitor center for the Georgetown-Silver Plume National Historic Landmark District resides at the southwest corner of 15th Street and Argentine Street (old U.S. 6) by Exit 228. Photo taken 08/11/16. A west side frontage road by Silver Gulch ties into the diamond interchange (Exit 228) with I-70 at 15th Street. Photo taken 08/11/16. Strong winds are common across the narrow Clear Creek valley stretching north from Georgetown to Empire Pass. A truck brake check station lies just after the 15th Street on-ramp. Photo taken 08/11/16. U.S. 40 east merges with Interstate 70 at the ensuing exit in four miles. Idaho Springs and Denver follow in 11 and 44 miles respectively. Photo taken 08/11/16. U.S. 6 remains a hidden counterpart of I-70 to Exit 244. Photo taken 08/11/16. Interstate 70 swings northeast to circumvent Douglas Mountain from Empire Pass east to U.S. 40. Photo taken 08/11/16. Increasing traffic, especially on weekends, led to the implementation of the I-70 Mountain Express Lane. The toll lane starts at the trumpet interchange (Exit 232) with U.S. 40 east. Photo taken 08/11/16. The Mountain Express Lane utilizes all electronic tolling (AET). Collection methods use ExpressToll transponders or toll by plate at a higher rate. Photo taken 08/11/16. Variable speed limits are used to Exit 243 (Central City Parkway). The tolled Express Lane opens during peak travel periods along Interstate 70. Photo taken 08/11/16. U.S. 40 is the primary route west from Denver and I-70 to Salt Lake City. U.S. 40 is an all-weather highway, but care should be taken when traversing the highest points in winter, such as Rabbit Ears Pass near Steamboat Springs. Photo taken 08/11/16. West from Exit 232, U.S. 40 follows the West Fork of Clear Creek to Stanley Mountain, where it turns north through a series of switchbacks to Berthoud Pass. The US highway reaches Winter Park ski area in 25 miles. Ski Granby Ranch lies 20 miles further. Photo taken 08/11/16. U.S. 40 is the best route from Interstate 70 into Rocky Mountain National Park during the summer months, as the trip requires only a brief journey east on U.S. 34. However, Estes Park (at the eastern entrance to the park) is not accessible via this route during the winter. During winter months, it is advisable to use U.S. 36 (Denver-Boulder Turnpike) northwest from the Denver area. Photo taken 08/11/16. The I-70 Mountain Express Lane stretches 13 miles east from Exit 232 to a point just past the Twin Tunnels. Photo taken 08/11/16. A sharp loop ramp (Exit 232) takes motorists onto U.S. 40 west to the nearby town of Empire. U.S. 40 travels 46 miles north to Granby, where U.S. 34 ends from the east, and 258.26 miles overall to the Utah state line near Dinosaur. Photo taken 08/11/16. Exit 233 consists of a lone ramp onto the parallel Frontage Road (old U.S. 6-40) at the settlement of Lawson. Photo taken 08/11/16. Commercial trucks are directed into the right lane ahead of Exit 232 for the eventual off-ramp (Exit 234) to the Dumont port of entry. Photo taken 08/11/16. Per CDOT standards, U.S. 6 and U.S. 40 are not posted on their implied concurrency with Interstate 70 east. Photo taken 08/11/16. Eastbound I-70 at the Exit 233 to old U.S. 6-40 through Lawson. Return access in either direction requires following the Frontage Road to subsequent on-ramps. Photo taken 08/11/16. The I-70 Mountain Express Lane was implemented by the Colorado Department of Transportation to reduce congestion between Empire and Idaho Springs. The $72 million project converted the eastbound shoulder into a travel lane for use during peak periods. Variable tolling increases costs during heavier traffic to ensure acceptable travel speeds.1 Photo taken 08/11/16. The Express Lane acts as a breakdown lane during non peak periods. Lane changes are only permitted at ingress and egress points. Photo taken 08/11/16. Although signed exclusively for the port of entry (weigh station), Exit 234 also connects with old U.S. 6-40 (Frontage Road) and several travelers services. Photo taken 08/11/16. Old U.S. 6-40 runs along the north side of I-70 from Downieville at Exit 234 to a half diamond interchange (Exit 235 on I-70 west) in nearby Dumont. Photo taken 08/11/16. The eastbound lanes directly parallel Clear Creek to the diamond interchange (Exit 234) with Mountain Street north. Weigh stations operate along side on-ramps to both I-70 east and west here. Photo taken 08/11/16. Interstate 70 drops below 8,000 feet above sea level at Dumont. Photo taken 08/11/16. The 1966-opened freeway east from Dumont to Hoosac Gulch (Exit 238) was constructed directly over U.S. 6-40. Photo taken 08/11/16. Dynamic message signs and speed limits along Interstate 70 east ahead of Spring Gulch and Bellevue Mountain. Photo taken 08/11/16. Fall River Road parallels its namesake north from Interstate 70 at Exit 238 toward Bald Mountain, Mount Pisgah and Arapaho National Forest. Photo taken 08/11/16. Fall River Road spurs 9.2 miles northwest to the communities of Alice and St. Marys. Photo taken 08/11/16. Entering the modified diamond interchange (Exit 238) with Fall River Road north. The 1940s alignment of U.S. 6-40 previously crossed Clear Creek here and followed what is now Stanley Road east into Idaho Springs. Photo taken 08/11/16. 2015 traffic counts increase to 44,000 vpd along eastbound Interstate 70 leading into Idaho Springs. Photo taken 08/11/16. The first egress point for the Mountain Express Lanes allows drivers to shift onto the general travel lanes to exit for Idaho Springs. Photo taken 08/11/16. Business Spur I-70 (Colorado Boulevard) partitions with Interstate 70 east at a half diamond interchange (Exit 239) in a half mile. Photo taken 08/11/16. Green outs were added to Exit 239 signs over shields for Business Loop I-70 in 2016. Colorado Boulevard leads east through the Idaho Springs town center to Exit 241A. CDOT inventoried the 2.71 mile long business loop as Route 070K. Photo taken 08/11/16. The Idaho Springs bypass opened to traffic in 1960 for U.S. 6 & 40.2 I-70 straddles the hillside south of the town street grid. Photo taken 08/11/16. Colorado 103, a 22.48 mile route south to Squaw Pass (el. 9.807 feet), meets I-70 south from Business Loop I-70 (Colorado Boulevard) at Exit 240. Photo taken 08/11/16. A Colorado scenic byway, Colorado 103 meanders west and south to Echo Lake, where it connects with Colorado 5. Leading to the summit of Mount Evans (el. 14,264 feet), Colorado 5 is the highest state highway in the country. Photo taken 08/11/16. SH 103 climbs onto Warrior, Chief and Squaw Mountains east from SH 5 to end at County Road 151 (Little Bear Creek Road). Little Bear Creek Road north ties into Soda Creek Road south of Idaho Springs. Photo taken 08/11/16. Continuing east over Clear Creek and Soda Creek Road, another set of dynamic message and speed limit signs appear. Photo taken 08/11/16. Chain law sign posted to the north of Santa Fe Mountain. Interstate 70 remains around 7,600 feet above sea level at this point. Photo taken 08/11/16. Colorado Boulevard returns and crosses over Interstate 70 at the east end of the Idaho Springs business district. Construction in 2015 reconfigured Exit 241 with the addition of a roundabout along Business Loop I-70 to the north, and the removal of the sharp ramp (old Exit 241A) for Colorado Boulevard westbound. Photo taken 08/11/16. Exit 241A was redesigned and now carries all traffic to both directions of Colorado Boulevard. Additional construction upgrades County Road 314 east as a full frontage road along I-70 south to Exit 243. Photo taken 08/11/16. An ingress point for the I-70 Mountain Express Lanes is located just beyond the on-ramp from Colorado Boulevard. Photos taken 08/11/16. U.S. 6 emerges from its hidden overlap with Interstate 70 east via a left side ramp (Exit 244) in 2.5 miles. Photo taken 08/11/16. A chain station lines the south side of Interstate 70 at milepost 242. The freeway remains within the Idaho Springs city limits east to Exit 243. Photo taken 08/11/16. Previously upcoming Exit 243 consisted of a diamond interchange serving local traffic for the south side frontage road at Hidden Valley. The introduction of gambling in the early 1990s at Black Hawk and Central City propelled growth in both of the small cities. With increasing traffic along SH 119 from U.S. 6 to the southeast, Central City government and area businesses funded a $38 million project to build a new highway providing a direct route with Interstate 70. Named Central City Parkway, the winding corridor opened north from Exit 243 on November 19, 2004.1 Photo taken 08/11/16. 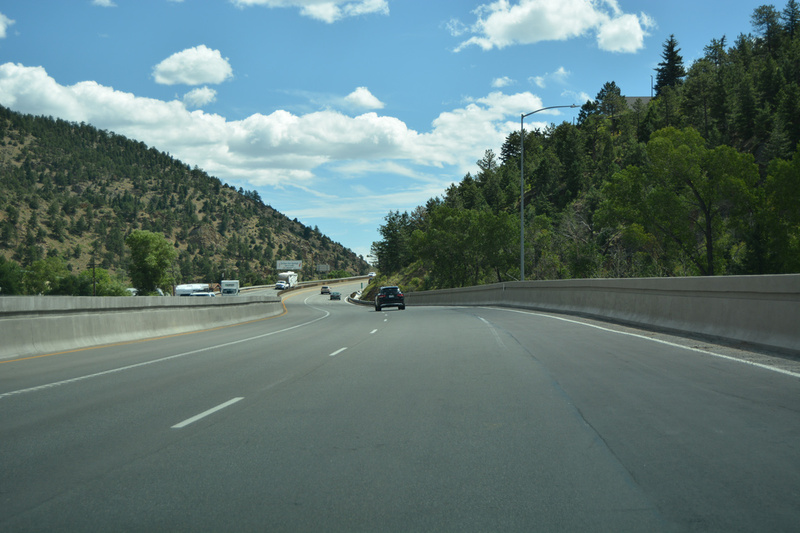 The Mountain Express Lane extends east through the Idaho Springs Twin Tunnels. Construction in 2013 expanded the eastbound tunnel by an additional lane. This work followed a 2012 project to add a modern frontage road along the south side of I-70 from nearby to Exit 243. During a prolonged detour, eastbound motorists were redirected onto the adjacent service road as crews widened the tunnel.4 Photo taken 08/11/16. The $55 million Twin Tunnels project commenced along I-70 east in April 2013. Work also included expansion of the westbound bore to include space for a future westbound lane. That tunnel closed to traffic in April 2014 and reopened in December 2014.5 Photo taken 08/11/16. The Colorado State Legislature passed a bill to rename the I-70 Twin Tunnels to the Veterans Memorial Tunnels in April of 2015.6 Photo taken 08/11/16. New lighting systems were installed for both of the Veterans Memorial Tunnels along Interstate 70 as part of the widening project.5 Photo taken 08/11/16. Central City Parkway stems north from Interstate 70, a half mile beyond the tunnel east portal. The four-lane highway winds eight miles northwest to Nevada Street in Central City. Photo taken 08/11/16. A rock cut for the 2014-opened Central City Parkway appears on the north hill side as Exit 243 departs for Hidden Valley. The I-70 Twin Tunnels Project included the rebuilding of the bridge over Clear Creek here. Photo taken 08/11/16. The Mountain Express Lane ends one half mile east of the Hidden Valley interchange. Photo taken 08/11/16. Interstate 70 winds east by Sawmill Gulch before curving southeast by Saddleback Mountain. Photo taken 08/11/16. U.S. 6 east connects I-70 with SH 119 north toward Blackhawk, Rollinsville and Nederland. Eldora ski area is a 32 mile drive via the state highway north to Nederland. Photo taken 08/11/16. U.S. 6 and 40 partition with Interstate 70 at an inverted wye interchange (Exit 244) in 0.75 miles. The forthcoming exit leads primarily to Golden, home of the Coors Brewing Company. Photo taken 08/11/16. Colorado 119 stems north from U.S. 6, three miles east of Exit 244 at Clear Creek Canyon. The state highway winds northwest to Black Hawk, which is located adjacent to Central City in Gilpin County. Central City was greened out for Exit 244 following completion of Central City Parkway to the west. Photo taken 08/11/16. Segment G of U.S. 6 stretches 27.41 miles along Clear Creek Canyon to eventually reach urban areas of Golden, Lakewood and Denver. Route 006G concludes at Interstate 25 near Downtown Denver. Although unmarked at Exit 244, U.S. 40 also runs independent of I-70, following the north side frontage road south from U.S. 6 nearby to Exit 251. Photo taken 08/11/16. Interstate 70 turns southward away from Clear Creek with three through lanes from Exit 244 to the bottom of Floyd Hill. Photo taken 08/11/16. Another steep descent awaits eastbound truckers nine miles ahead as I-70 navigates through Mount Vernon Canyon. Photo taken 08/11/16. Exit 247 constitutes a split diamond interchange with Beaver Brook in Clear Creek County and Floyd Hill in Jefferson County. Photo taken 08/11/16. An access road links the eastbound off-ramp (Exit 247) with Hyland Drive and Beaver Brook Canyon Road to the south and U.S. 40 (Route 040B) to the north. Photo taken 08/11/16. Approaching the western suburbs of Denver, Interstate 70 still remains fairly rural on the descent into Mount Vernon Canyon. Deer, Elk and other wildlife may be present on the ensuing ten miles. Photo taken 08/11/16. "Colorado Department of Transportation - I-70 Mountain Express Lane." America&apos;s Transportation Awards, June 15, 2016. I-70 Eastbound Twin Tunnels fact sheet (CDOT). "Twin Tunnels Get New Name As Construction Wraps Up." CBS Denver, December 15, 2014. I-70 Westbound Twin Tunnels (Veterans Memorial Tunnels). Colorado Department of Transportation project web site. Accessed April 10, 2017.